Never let Mother Nature dampen your style! 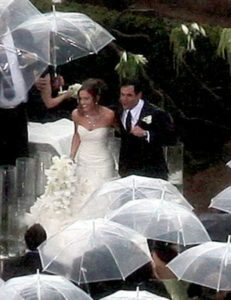 We all recall the downpour that came during the vows shared by Molly and Jason during “The Bachelor” in 2010! We watched in horror as the Bride Molly’s stunning $45,000 Monique Lhuillier gown and perfectly styled up do hair became drenched by heavy rain. But Molly and Jason, and their guests, found joy and laughter in the crazy rain storm that took center stage of their nuptials! 1. 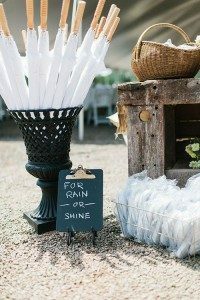 Choose a venue that keeps you happy rain or shine! 2. Tent Wedding? Don’t forget to reserve “sides” for your tent. This protects you from wind and rain. 4. Bugs! Ew. Have your event space treated ahead of time to control for pesky bugs and mosquitos. Let your sunglasses be your “something blue.” Show off your new monogram by having it embroidered on your cozy new Uggs that you wear to leave your snowy reception in. The Trusty Old Farmer’s Almanac to the Rescue! The Old Farmer’s Almanac has been accurately predicting weather pattern cycles since 1792 and is an amazing tool for determining when to have your wedding.